Great Image Integration Sdn Bhd was established in 2006 based on the firm foundation of Copier Machine. Great Image Integration Sdn Bhd provides sales, rental, repair & service of office equipment such as printers, photocopiers, fax machines. The objective of the company is to establish itself as a strong and reputable distributor in office equipment and telecommunication equipment among in Johor region. To achieve this, the company's products are hand selected from thousands of off-lease copiers and are in like-new condition. All used copiers are carefully tested, cleaned, and refurbished if need be, to ensure top performance. 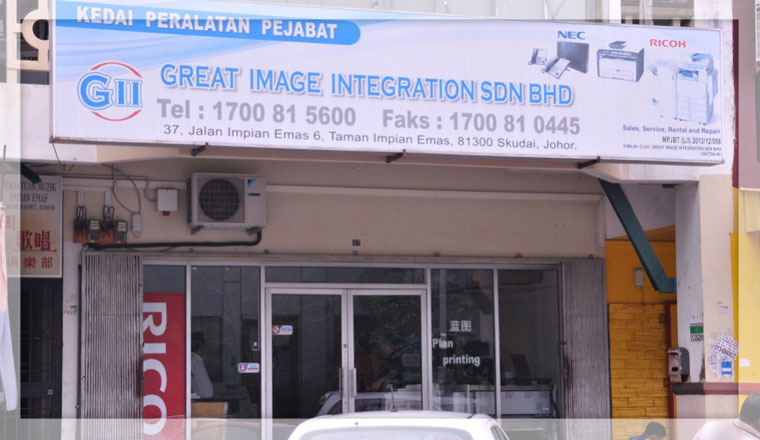 Great Image Integration Sdn Bhd’s Mission is to provide with the finest services, most efficient copiers supplies available in the market at the lowest prices and guarantee of customer satisfaction. Great Image Integration Sdn Bhd's vision is simple yet not easy; it is to be the leader in the used copiers industry, we want to help all our customers make their lives and business better with products abd services that are tailored to their needs and easy to use. Our goal is therefore to save our customer's time and money by providing prompt, friendly service at the lowest prices as possible. A few years of achievement, Great Image Integration Sdn Bhd has obtains a reputation in Johor. Lot of customers was sastified with the company and team of staff. Great Image was proudly happy to enjoy and has a strong team from technical,sales and adminstrative to support.